Configuring DayBack to work with your Salesforce objects is done almost entirely by filing out a form in DayBack's source settings screen. Each object you map to will be shown as a separate " source" in the calendar and you can elect for some or all of these sources to be showing at any given time. DayBack will have created a few standard objects for you when you first add DayBack to your org; it creates sources for Events, Tasks, Campaigns and Opportunities by default and you can see how these are mapped as examples for creating sources for your own objects. The Field Mapping form will describe the fields available in DayBack and a couple of required fields you may need to add to any custom objects. And you can mark any fields that don't apply to your object as "unused". If there is no unused checkbox beside a field then it's required for the calendar to function. If you're the admin of your org you're already an administrator in DayBack and clicking on "Settings" in the calendar's left hand sidebar will reveal an "Administrator Settings" button that will let you configure sources. Having first created your new source you'll continue editing the source settings by mapping the fields DayBack needs to know about in order to show your item on the calendar. For each field, click "Details" to learn more about which Salesforce field DayBack expects. Most fields have a place for the field name in Salesforce and a place for the "Display as" value. Looking at the first field, "Start"... notes). Start - this is the name of the field in Salesforce that contains your object's start date or date/time. If you have only one date field, like a due date, this is where you map it. Start is a required field, unlike "End". In the case of Tasks this would be "ActvityDate" (without the quotes). Display as - use this for the field label you'd like to see when viewing or editing the item in DayBack. In the case of Tasks this might be "Due" (without the quotes). This doesn't need to correspond to any value in Salesforce and can be different than the field label you use there. Continue mapping your fields, assigning a field name and a label to each field you need to show, or marking that field as "unused" if it doesn't apply to your object. (If you don't see an option for "unused" beside a field then that field is required. When you get to Name (Who) this is where you specify which field holds the name of the person linked to your event. For native Salesforce Activity objects this will almost always be "Who.Name" (without the quotes) and the WhoID will be "WhoId" (without the quotes), but this section can also support any Look-Up or Master-Detail relationship in Salesforce includingfor Custom Objects. Related To (What) is similar but for parent objects like the Campaign to which a task belongs. Again, for native Salesforce Activity objects this will almost always be "What.Name" (without the quotes) and the WhatId will be "WhatId" (without the quotes), but this section can also support any Look-Up or Master-Detail relationship in Salesforce includingfor Custom Objects. Start - the starting date or date/time of the object. If you only have one date field in your object, like a due date, use that field here. Title - this is the field that shows up when you see the event in the calendar: it's the name of your event, like "Meeting with Tim". TitleEdit - this may be the same field as title, but this is the editable title that shows in the popover when you go to edit an item in the calendar. The reason DayBack offers both Title and TitleEdit is that you may want to make a formula field for Title to display some concatenated information about the event on the calendar, leaving TitleEdit for a field you can actually edit. The status and resource fields are a bit different in that the status field is used for color coding your item and the resource is used to assign it a column in the resource scheduling views. Resource scheduling is one of the real strengths of DayBack and you'll eventually want to read up on the available resource scheduling views here: Resources Overview. But for now, you can map the resource to "Owner.Name" (without the quotes)--which is what DayBack does by default for your events and tasks. That's the owner of the item and will be assigned to the logged in user if you leave the resource in DayBack blank. You can also map this to any text field or multi-value picklist. More on your options here: mapping the resource field . 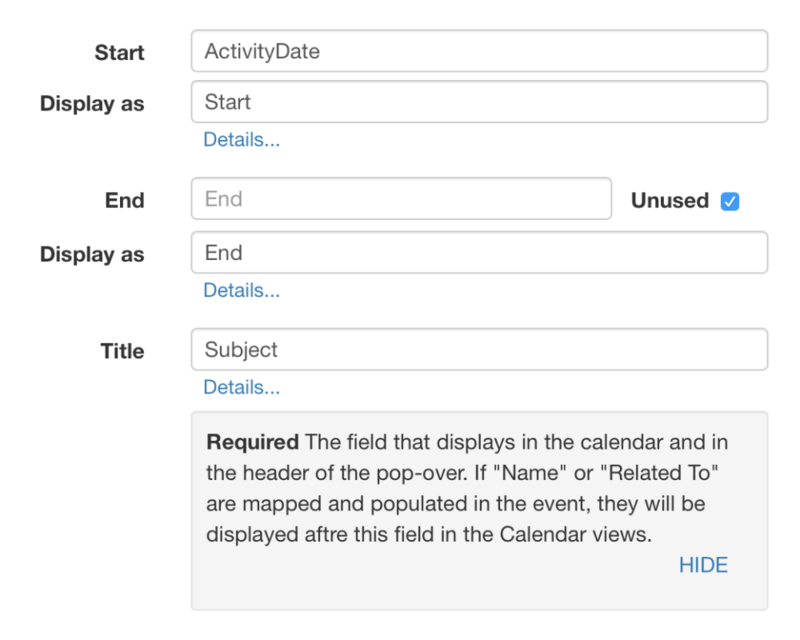 You can include custom fields in your calendar mapping. Just remember that Salesforce gives your custom field a suffix so if you have a custom field called "Sample", for example, the field's name in Salesforce is "Sample__c" (without the quotes). You can go beyond the fields shown in DayBack's popover by adding additional fields; this great for including required fields you may need when creating new items.